The fields of interest of the GRS Society are the theory, concepts, and techniques of science and engineering as they apply to the remote sensing of the earth, oceans, atmosphere, and space, as well as the processing, interpretation and dissemination of this information. The society sponsors various conferences throughout the year, most notably the annual International Geoscience and Remote Sensing Symposium. If you wish to purchase additional copies of publications included in your membership, please contact www.ieee.org/contactcenter. Membership includes the Essential Package. 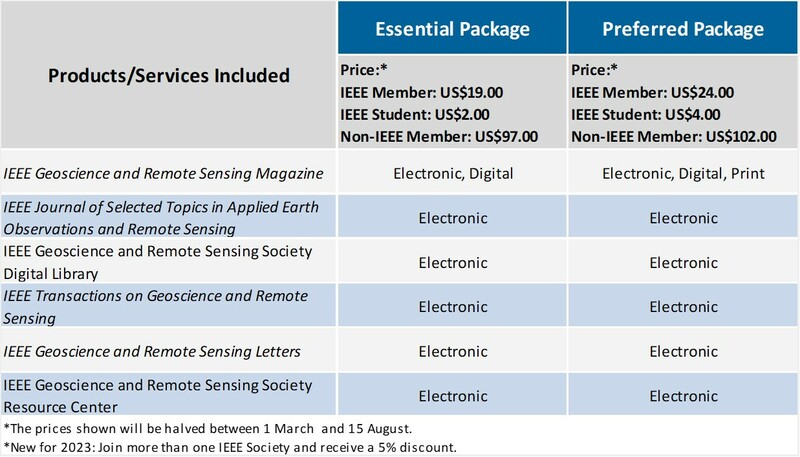 To select the Preferred Package, select 'Customize Options' in your cart at checkout and add IEEE Geoscience and Remote Sensing Magazine (print) for an additional US$1.50 for members or US$.50 for students.